This is a bag that i would recommend to you if you take projects with you to and from the house. Mine all travel to and from work from me. God forbid i forget a needle or floss one day i get pissed. so i made this little draw sting bag that i put whatever current project i am working on in to travel. 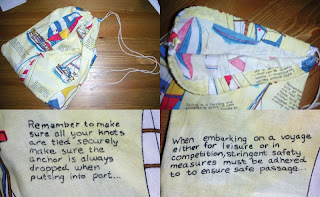 the fabric was just of some weird boating fabric i found one time with little sayings on it. i am going to make dan a pair of shorts with this ridiculous fabric for the summer. hahaha. I love it! It is perfect for you!! You could also tie it to a stick if you ever want to become a hobo! that's such a cute bag! i have to try to create this for my knitting. if you get in touch with me Artisticpixie i can show you some cool knitting needle holder tutorials. i want to make some soon myself to sell at my etsy shop!